At ATS Design Studio, each project is made to order, based on your personal specifications, scale drawings and in conjunction with our detailed conversations with you. The roots of ATS Design Studio date back to 1962, when a woodwork family business began a long-lasting father-to-son skill heritage. Re-established in 2000 in the United States, ATS Design Studio brings 40+ years of craftsmanship experience to meet your design needs in cabinetry. Today, ATS Design Studio offers a vast array of unique cabinet designs in an assortment of stylish materials, colors and long-lasting finishes. 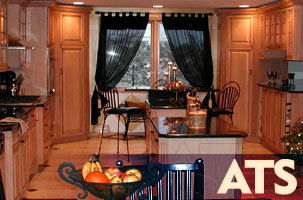 We design, craft and install our custom cabinetry for homes and businesses in the greater Chicago area. Most importantly, we will provide you with the information you need to make timely, educated decisions without feeling inundated. We will also work with your architect, contractor or designer to help ensure your choices complement the theme of your space. Your cabinetry will be finished to exacting standards, utilizing a multi-step process to retain your investment's quality and beauty. Please feel free to browse through our portfolio. Categorized photo galleries should help you get the idea of our products.